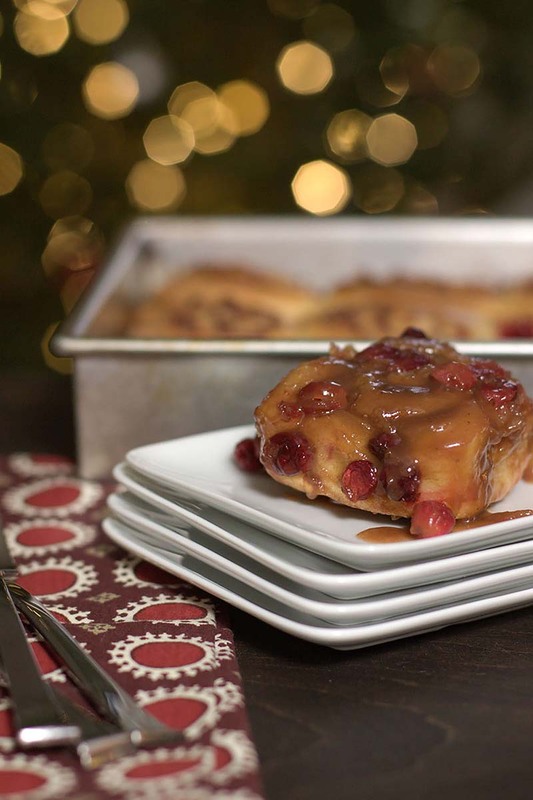 A brioche sweet roll filled with cranberries and pecans and a sticky cranberry topping. Sure to be a new family holiday tradition. To make the dough, combine the flour, sugar, yeast, salt, and orange zest in the bowl of your stand mixer. Whisk to combine. Add the milk and eggs. Attach the dough hook to the mixer, and mix on low speed for 3 – 4 minutes, until the dough starts to come together. Continuing to mix on low speed, gradually add the softened butter, a tablespoon at a time, mixing until the butter is incorporated into the dough before adding more. Once all of the butter has been added, increase the speed to medium and mix for 15 minutes. The dough should be smooth and shiny. Transfer the dough to a lightly greased bowl and cover tightly with plastic wrap. Refrigerate overnight. The next day, prepare the topping for the rolls: Combine the butter, sugar, brown sugar, and maple syrup in a saucepan over medium heat. Stir occasionally, cooking until the sugar has dissolved and the sauce starts to bubble slightly. Remove from the heat and whisk in the eggnog (or cream). Let cool for 30 minutes. Then, pour the topping into a greased 9 by 13-inch pan and sprinkle the cranberries over the topping. Set aside. To prepare the filling: combine the cranberries, pecans, sugar, and cinnamon in a food processor. Pulse until the cranberries and pecans are well chopped and all of the ingredients are combined. Transfer to a bowl and set aside. Remove the dough from the refrigerator and transfer to a lightly floured surface. The dough will feel a bit like cold play dough. Roll the dough out into an 18-inch by 10-inch rectangle. Spread the cranberry filling over the dough and roll up starting with the long edge. Cut the roll into 12 even slices, and place the slices cut-side up in the baking pan, nestling them down into the cranberries and topping. Cover the pan with a damp towel, and let the rolls rise until slightly puffy, about two hours. As the rolls finish rising, preheat the oven to 350°F. Bake the rolls for 40 – 45 minutes, until the tops are a deep golden brown. Let the rolls cool in the pan for at least 20 minutes before inverting each roll individually to serve. Yes, you can shape the rolls and then cover and let them rise in the refrigerator overnight. Let them warm at room temperature while the oven is preheating. will the integrity of the filling be compromised if the cinnamon is not added? We haven’t tried the recipe without cinnamon, but I think it should still taste delicious!